Setting: In the early 1900s, Russia’s ruler (the Czar) was living in luxury while the common people had to scratch out a living. The winds of change were blowing, but change comes slowly to Jewish (犹太人) families in the sleepy village of Anatevka whose traditions have long helped them keep their balance. Note: I’ve had students ask why Russian Jews speak English. American movies often make it look like everyone can speak English, but this is just for viewers’ convenience. (They probably spoke Hebrew or Russian among themselves!) You should also note that, throughout the story, when the main character looks up and talks to “nobody” he is really praying (talking to God). Messiah: to many Jews and Christians, the Messiah (or “Christ” in Greek) is one sent from God to restore God’s rule on earth by first saving people from sin and then being their king. In the movie The Robe, a Roman officer offers this description: “The Jews’ king, savior, redeemer, Son of their God…” Traditional Jews (like Motel, in Fiddler) say they are “still waiting” for the Messiah; Christians believe that Jesus Christ (耶稣) is the Messiah the Jews were waiting for. milkman: sb who raises milk cows and makes/sells cheese, butter, milk, etc. biddy biddy bum: this has no meaning; it just sounds good when singing it in a folk song! *fortune: [countable] a lot of money (e.g., “I wish I had a small fortune”); [uncountable] chance and the effect it has on your life (e.g., “May you be blessed with fortune and honor”; “It was his good fortune to get such an important job”). *match (v&n): a marriage, or to put people together in marriage; (n) a small stick that helps you start a fire (used this way in the movie: “This place is so unimportant that someone should have set a match to it long ago”). Read dialog 1, and then tell your partner about some of your family’s traditions. Read dialog 35. What do you think marriage should be “founded on”? After saying that Perchik and Hodel love each other, Tevye and his wife sing “Do you love me?” The song asks questions about what love is. What do you think love is? Read dialog 48-50. The Russian government ordered the officer to evict the Jewish people from their land for no good reason. Could you follow such an order and evict the neighbors you had known all your life? Afterward, could you continue to live there, or would you be like Fyedka who said “we can’t live among people who do such things to others”? Explain. Read and discuss dialog 38. Do you agree more with the father or daughter? What don’t you agree with and why? When Hodel is waiting for the train, she sings about being torn between “wanting home” and “wanting him” (i.e., the man she plans to marry). Many people want to live near their parents after they get married. What reasons would be strong enough to convince you to live far away? What do you think of Hodel’s last statement: “There with my love, I’m home”? Read dialog 42. If it is hard to imagine a father thinking of his daughter as being “dead to us,” picture a Chinese father who finds out that his daughter has been helping the Japanese in World War 2. This is the way Tevye felt — he thought his daughter was turning her back on the truth and on her people. Is there anything that could make you turn your back on your people? If you did this, would you expect your parents to still love and accept you? Would they? When the three oldest daughters decided to choose their own husbands, the first one begged her father to give permission, the second said she didn’t want permission but wanted the father to give his blessing (approval), and the third merely asked the father to “accept us” instead of thinking of them as being “dead to us.” In a way, they were each asking “a lot” of their father; do you think any of these young ladies was being reasonable? Explain. At the end, Chava’s sister couldn’t resist talking to her “traitor” sister, even though the father considered Chava “dead.” Would it be easier for a sister or a father to love such a person? Why? Do you think the father should have said more, or was his blessing (“and God be with you”) enough? When (under what conditions or with what payment) should people be forgiven after they do sth wrong? Can traitors be forgiven? Criminals? Sinners? Read dialog 50. When is it right to “fight back” and when is it right to “just obey”? Say what you think about Tevye’s statement? Say these dialogs out loud with your friends; it will help you prepare to watch the movie. The underlined words are defined in the vocabulary section above. Note: These may not be in the correct chronological order. Some are here simply because they are funny, and non-native speakers might not understand them without help. 1. Tevye: A fiddler on the roof. Sounds crazy, no? But here, in our little village of Anatevka, you might say every one of us is a fiddler on the roof, trying to scratch out a pleasant, simple tune without breaking his neck. It isn’t easy. You may ask ‘Why do we stay up there if it’s so dangerous?’ Well, we stay because Anatevka is our home. And how do we keep our balance? That I can tell you in one word: tradition! Because of our traditions, everyone knows who he is and what God expects him to do…. Traditions, traditions. 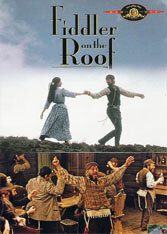 Without our traditions, our lives would be as shaky as… as… as a fiddler on the roof! 2. Tevye: Because of our traditions, we’ve kept our balance for many, many years. Here in Anatevka, we have traditions for everything: how to sleep, how to eat… how to work… how to wear clothes. For instance, we always keep our heads covered, and always wear a little prayer shawl that shows our constant devotion to God. You may ask, “How did this tradition get started?” I’ll tell you! [pause] I don’t know. But it’s a tradition… and because of our traditions… Every one of us knows who he is and what God expects him to do. Men (singing): Who day and night must scramble for a living, feed a wife and children, say his daily prayers, and who has the right as master of the house to have the final word at home? The Papa! The Papa! Tradition! The Papa! The Papa! Tradition! Women (singing): Who must know the way to make a proper home, a quiet home, a kosher home? Who must raise a family and run the home, so Papa’s free to read the Holy Book? The Mama! The Mama! Tradition! The Mama! The Mama! Tradition! Sons (singing): At three I started Hebrew School, at ten I learned a trade. I hear they’ve picked a bride for me, I hope she’s pretty. Daughters (singing): And who does Mama teach to mend and tend and fix, preparing her to marry whoever Papa picks? The daughters! The daughters! Tradition! 3. Tevye: And in the circle of our little village, We’ve always had our special types. For instance, Yente the matchmaker, Reb Nachum the beggar… And most important of all, our beloved Rabbi. Lebisch: Is there a proper blessing… for the Czar? Rabbi: A blessing for the Czar? Of course! May God bless and keep the Czar… far away from us! 4. Tevye: Then there are the others in our village. They make a much bigger circle. We don’t bother them, and so far, they don’t bother us. And among ourselves, we always get along perfectly well. [pointing to Itchak and Avram] Of course, there was the time when he sold him a horse and told him it was only six years old, when it was really 12. But now, it’s all over, and we live in simple peace and harmony. 5. Mordcha: May the authorities be like onions with their heads in the ground! 6. Mordcha: May the Czar have his own personal plague! 7. Mordcha: Why should I break my head about the outside world? Let the outside world break its own head! Well put, no? 8. Mordcha: If the rich could hire others to die for them, we–the poor–would all make a nice living. 9. Tevye: And until your golden day comes, Rev. Perchik, how will you live? Perchik: By giving lessons to children. Do you have any children? Tevye: I have five daughters. Perchik (Looking to Tevye in disbelief): Five? 10. Golde: You’ll be late. Tevye: Golde, I won’t be late. Tevye: I won’t be late! I won’t be late! If you ever stop talking, I won’t be late! Tzeitel: But Mama, the men she finds. The last one was so old, and he was bald. He had no hair. Golde: A poor girl without a dowry can’t be so particular. You want hair, marry a monkey. 12. Yente: From such children come other children! Yente: Ah, children, they are your blessing in your old age. My poor Aaron, God rest his soul, couldn’t give me children. Between you and me, Golde, he hardly tried. Hodel (singing): For Papa, make him a scholar! Chava (singing): For Mama, make him rich as a king! Hodel, Chava: For me, well, I wouldn’t holler if he were as handsome as anything! Hodel, Chava: Matchmaker, matchmaker, make me a match! Find me a find, catch me a catch! Night after night in the dark I’m alone, so find me a match of my own! 14. Hodel: We only have one Rabbi, and he only has one son. Why shouldn’t I want the best? Tzeitel: Because you’re a girl from a poor family. So whatever Yente brings, you’ll take. Right? Of course, right! Tzeitel (singing, and mimicking Yente): Hodel! Oh Hodel, have I made a match for you! He’s handsome, he’s young! All right, he’s sixty-two. But he’s a nice man, a good catch, true? True! I promise you’ll be happy, and even if you’re not, there’s more to life than that… Don’t ask me what. Tzeitel: Chava, I’ve found him; will you be a lucky bride! He’s handsome, he’s tall! That is, from side to side, but he’s a nice man, a good catch, right? Tzeitel: You heard he has a temper. Hodel: He’ll beat you every night. Tzeitel, Hodel: So you’re all right! Tevye: And all this from killing innocent animals. 16. Lazar Wolf: How is your brother-in-law in America? Tevye: Oh, he’s doing very well. Tevye: I won’t insult you by saying no. Tevye: I always wanted a son, but I wanted one a little younger than myself. 18. Men (singing): And if our good fortune never comes, here’s to whatever comes. All: To life, to life, L’Chaim! 19. Constable: You’re an honest, decent person. Even though you are a Jew. Tevye (drunk): Oh… THANK you, your honor. How often does a man get a compliment like that? …Thank you, your honor. You are a good man. If I may say so, it’s too bad you’re not a Jew. Constable (laughs): That’s what I like about you, Tevye. You’re always joking. Motel: Times are changing, Reb Tevye. The thing is, over a year ago, your daughter, Tzeitel, and I gave each other our pledge that we would marry. Tevye: You gave each other a… pledge? They gave each other a pledge? Unheard of. Absurd. Tzeitel: Yes, Papa. We gave each other our pledge. Tevye: But you are just a poor tailor! Motel: That’s true, Reb Tevye, but even a poor tailor is entitled to some happiness! Tevye (explaining the dream): In the middle of the dream, in walks your grandmother Tzeitel, may she rest in peace. Golde: Grandmother Tzeitel? How did she look? Fruma Sarah (Lazor’s dead wife; also in the dream): How could you allow it? How? How could you let your daughter take my place? Live in my house, carry my keys, and wear my clothes, pearls? Ghosts (singing): How could you allow your daughter to take her place? 22. Tevye (singing): Is this the little girl I carried? Is this the little boy at play? Golde (singing): I don’t remember growing older. When did they? 23. Perchik (singing): They look so natural together. Hodel (singing): Just like two newlyweds should be. Perchik, Hodel (singing): Is there a canopy in store for me? All (singing): Sunrise, sunset; sunrise, sunset; swiftly fly the years… one season following another, laden with happiness and tears. Mendel: She’s dancing with a man! Tevye: I can SEE that she’s dancing with a man! [pause] And I’m going to dance with my wife! 27. Tevye: As the Good Book says, if you spit in the air, it lands in your face. 28. Tevye: As the Good Book says, when a poor man eats a chicken, one of them is sick. Where does the Book say that? 30. Perchik: I’m a very good teacher. Hodel: I heard that the Rabbi who must praise himself has a congregation of one. Golde: The Good Book can wait, it’s time for Sabbath. Tevye (quietly to Perchik): …the tongue she gets from her mother. 31. Perchik: In this world it is the rich who are the criminals. Someday their wealth will be ours. 32. Perchik: Money is the world’s curse. 33. Perchik: You’ll all chatter yourselves away into the grave. 34a. Tevye (to God): I know, I know. We are Your Chosen People. But, once in a while, can’t You choose someone else? 34c. Tevye: It may sound like I’m complaining, but I’m not. After all, with Your help, I’m starving to death. 34d. Tevye: Anyway, Motel and Tzeitel have been married for some time now. They work very hard, and they’re as poor as squirrels in winter. But, they’re so happy, they don’t know how miserable they are. 34e. Tevye: As the Good Book says… [he chuckles] Why should I tell You what the Good Book says? 35. Perchik: There’s a question… A certain question I want to discuss with you. Perchik: It’s a political question. Perchik: The question of… marriage. Hodel: Is this a political question? Perchik: Yes, that is an important element! At any rate, I personally am in favor of such a socioeconomic relationship. Hodel: I think… you are asking me to marry you. Perchik: Well… in a theoretical sense… yes. I am. Hodel: I was hoping you were. Perchik: Oh, Hodel. I’m very, very happy! Tevye (to himself, and to God): He loves her. Love, it’s a new style… On the other hand, our old ways were once new, weren’t they?… On the other hand, they decided without parents, without a matchmaker!… On the other hand, did Adam and Eve have a matchmaker?… Well, yes, they did. And it seems these two have the same Matchmaker! 37. Tevye (in song): Do you love me? Golde (speaking): I’m your wife! Tevye (speaking): I know! [in song] But do you love me? Golde (singing): If that’s not love, what is? Tevye (singing): Then you love me! Golde: I suppose I do! Tevye: Oh. [sings] And I suppose I love you too. Tevye, Golde (singing): It doesn’t change a thing, but even so… After twenty-five years, it’s nice to know. 38. Tevye (talking about Perchik, as Hodel is leaving on a train for Siberia): Is he in bad trouble, that hero of yours? [Hodel nods] Arrested? [she nods again] Convicted? Hodel: Yes. But he did nothing wrong. He cares nothing for himself. Everything he does is for other people. Tevye: Yes, but if he did nothing wrong, he wouldn’t be in trouble. Hodel: Oh Papa, how can you say that? What wrongs did Joseph do? And Abraham, and Moses? And they had troubles. Tevye: Yes, but… But why won’t you tell me where he is now, this Joseph of yours? Hodel: It is far, Papa. Terribly far. He is in a [prison] settlement in Siberia. Tevye (shocked): Siberia! And he asks you to leave your father and mother, and join him in that frozen wasteland and marry him there? Hodel: No, Papa. He did not ask me to go. I want to go. I don’t want him to be alone. I want to help him in his work. Hodel: Papa. [sings] How can I hope to make you understand, why I do what I do? Why I must travel to a distant land, far from the home I love. Once I was happily content to be, as I was, where I was. Close to the people who are close to me, here in the home I love. Who could see that a man would come, who would change the shape of my dreams? Helpless now, I stand with him, watching older dreams grow dim. Oh, what a melancholy choice this is, wanting home, wanting him… Closing my heart to every hope but his, leaving the home I love. There where my heart has settled long ago, I must go, I must go. Who could imagine I’d be wandering so far from the home I love. Yet… there with my love, I’m home. Tevye (concerned): And who, my child, will there be to perform a marriage there in the wilderness? Hodel (smiling): Papa, I promise you, we will be married under a canopy. Tevye: Yes, yes. No doubt, a Rabbi or two were also arrested. Hodel (crying and hugging him): Papa! God alone knows when we shall see each other again. Tevye: Then, we will leave it in His hands. Tevye (looking up): Take care of her. See that she dresses warm. 39. Fyedka (introducing himself to Chava): I’m a pleasant fellow, charming, honest, ambitious, quite bright, and very modest. 40. Fyedka: Your father is coming. Chava, let me talk to him. Let me tell him about us. Chava: No, Fyedka, that would be the worst thing, I’m sure of it. Fyedka: But let me try! Chava: No! I’ll talk to him. I promise. 41. Tevye (after seeing Chava and Fyedka talking): What were you and he talking about? Chava: Nothing. We were just talking. Tevye: Chaveleh, I would be much happier if you remained friends from a distance. You must not forget who you are [a Jew] and who that man is [a non-Jew]. Chava: He has a name, Papa. Tevye: Of course. All creatures on Earth have a name. Chava: Fyedka is not a creature, Papa. Fyedka is a man! Tevye: Who says he isn’t? It’s just that he’s a different kind of man. As the Good Book says, “Each shall seek his own kind.” In other words, a bird may love a fish, but where would they build a home together? Chava: The world is changing, Papa! Tevye (firmly): No! [then calmly] No. Some things do not change for us. Some things will never change. Chava: We don’t feel that way. Chava: Fyedka and I… We want to be married. Tevye: What? Are you out of your mind? Don’t you understand what that means, marrying outside of the faith? Tevye: I said no! Never talk about it again. Never mention his name again. Never see him again. Do you understand me? Chava (quietly): Yes, Papa. I understand you. 42. Golde (very upset): Tevye! Tevye! Golde: It’s Chava. She left home this morning, with Fyedka. Golde: I’ve looked everywhere for her. I even went to the priest. He told me they were married. Tevye: Well… Go home, Golde. We have other children at home. You have work to do, I have work to do, go home. Tevye: Chava is dead to us! We’ll forget her. [gently] Go home. Go home, Golde. 44. Tevye: How can I turn my back on my faith and my people? If I try to bend that far, I’ll break. 45. Golde: Oh, you’re finally here. Come, let’s go home now. Tevye: I want to see Motel’s new machine. Golde: You can see it some other time. Let’s go home now. Tevye: Quiet, woman, before I get angry! Because when I get angry, even flies don’t dare to fly! Golde (sarcastically): I’m very frightened of you. After we finish supper I’ll faint. Tevye (angrily): Golde, I am the head of the house! I am the head of the family! And I want to see Motel’s new machine NOW! Tevye: Now, let’s go home. Yente: The postman told me there was a letter for your sister, Hodel. Tzeitel: Thank you, I’ll go and get it. Yente: I got it. It’s, ah, from her intended, Perchik. Tzeitel: Oh, she’ll be so happy, she’s been waiting to hear from… but it’s open! 47. Yente: People! I tell you, Tzeitel, if God lived on earth, people would break his windows! Tevye: Welcome, your honour, what’s the good news in the world? Constable: I see you have company. Tevye (looks at them nervously): They are my friends. Constable: It’s just as well. What I have to say is for their ears also. How much time do you need to sell your house and household goods? Tevye: Why should I sell my house? Is it in anybody’s way? Constable: I came to tell you that you have to leave Anatevka. Tevye: How did I come to deserve such an honour? Constable: Not just you of course, but all of you! 49. Lazar Wolf: We can fight to keep our home. Constable: Against our militia, our army? I wouldn’t advise that! Tevye: I have some advice for you. Get off my land. This is still my home, my land. Get off my land. 50. Villager (who wanted to fight the authorities and stay in his home, quotes the Bible): “An eye for an eye and a tooth for a tooth” (i.e., if they hurt us we should hurt them the same way). 51. Motel (on being evicted): Rabbi, we’ve been waiting all our lives for the Messiah. Wouldn’t now be a good time for Him to come? Rabbi: We’ll have to wait for him someplace else. Meanwhile, let’s start packing. 52. Lazar Wolf: How is it going with you, Reb Tevye? Tevye: I’m sorry to hear that. Tevye: Chicago, America? We are going to New York, America. We’ll be neighbors. Lazar: I hate him [my brother-in-law], but a relative is a relative. 54. Chava: I’ll write to you in America if you like. Golde (shouts): We’ll be staying with Uncle Avram! Tevye (annoyed): We’ll be staying with Uncle Avram! We’ll be staying with Uncle Avram! The whole world has to know our business! 55. Golde (about Tevye): You can die from such a man! 56. [last lines] Tevye: All right children. Let’s go. ©2013 Michael Krigline. See our Website Standards and Use Policy.